President Trump and first lady Melania Trump greet members of the U.S. military during an unannounced trip to al-Asad Air Base in Iraq on Wednesday. 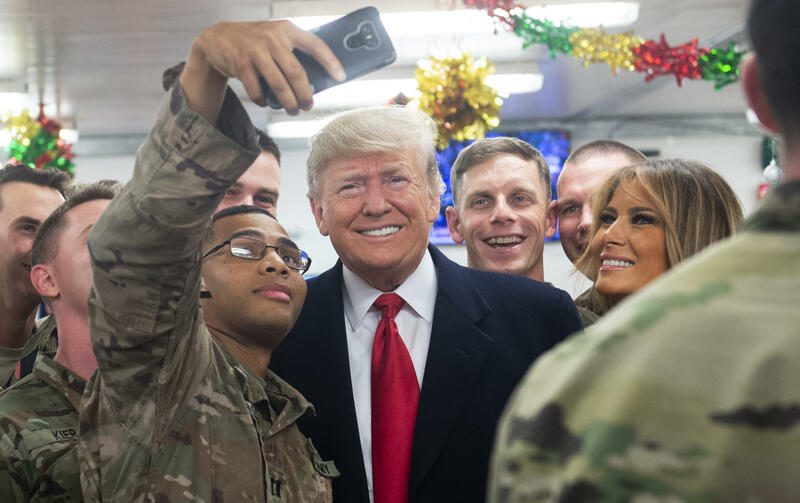 President Trump and first lady Melania Trump traveled to Iraq to visit U.S. troops on the day after Christmas, an unannounced trip about which the president nonetheless had been hinting for some time. The Trumps' arrival at Al Asad Air Base followed the president's recent orders to pull back on U.S. troop deployments elsewhere — orders that have come under intense scrutiny. The trip to Iraq was announced on Twitter by press secretary Sarah Sanders. It's the president's first such visit since taking office nearly two years ago. The president and the first lady spent about three hours at Al Asad, in western Iraq. Air Force One landed back at Joint Base Andrews outside of Washington, D.C. at 5:13 a.m. ET on Thursday. At al Asad, Trump delivered a speech and defended his decision to withdraw American forces from Syria. The president described how he gave commanders multiple six-month extensions to get out of Syria, according to a pool report. Trump said: "They said again, recently, 'Can we have more time?' I said, 'Nope. You can't have any more time. You've had enough time.' "
The work fighting the Islamic State is finished, Trump said. "We've knocked them out. We've knocked them silly." Trump suggested that Turkey's military might take up the fight against the Islamic State. "I will tell you that I've had some very good talks with President [Recep Tayyip] Erdoğan who wants to knock them out also and he'll do it. And others will do it, too. Because we are in their region. They should be sharing the burden of costs, and they're not." It isn't clear what Turkey has committed to Trump or what the American withdrawal will mean for the Kurdish fighters who have been fighting in northern Syria with American support. Joint Chiefs Chairman Gen. Joe Dunford and other top defense officials have said the United States needs to train tens of thousands of fighters in Syria to be able to establish order there. That work is a long way from complete. Trump said he viewed the United States as having been taken advantage of by regional free-riders. Turkey and Saudi Arabia and other powers must do more, he said, and the United States is finished carrying the load it has borne unfairly in the Middle East. "America shouldn't be doing the fighting for every nation on Earth, not being reimbursed in many cases at all," Trump said. "If they want us to do the fighting, they also have to pay a price and sometimes that's also a monetary price. So we're not the suckers of the world. We're no longer the suckers, folks. And people aren't looking at us as suckers." Trump didn't meet with Iraqi Prime Minister Adel Abdul Mahdi because the president had asked the Iraqi leader to travel from the capital, Baghdad, to meet Trump in Al Asad, Iraqi political sources told NPR. The president's request was viewed by Iraqis as disrespectful of their sovereignty. The president and the first lady did meet with American troops. They visited a dining hall and posed for photos and signed autographs. Al Asad was an Iraqi regime air base until the 2003 U.S. invasion, when it became a centerpiece of U.S. Marine Corps and coalition operations in Anbar province. The base continues to host smaller detachments of American forces supporting the Iraqi government's war against the Islamic State as well as American operations in Syria. U.S. troops stationed in Iraq are there primarily to help Iraqi forces stabilize the country after its years-long battle against the Islamic State. The total number of U.S. troops in Iraq numbered about 5,200 as of Oct. 31. Al Asad hosts a large number of special operations forces, including Army, Navy and Air Force personnel. Air Force One departed in darkness and under a shroud of secrecy at 12:06 a.m. Rather than park on the tarmac at Andrews Air Force Base as is standard for presidential trips, the iconic jetliner remained in a hangar until takeoff. Aviation enthusiasts using open-source flight tracking software began to deduce on Wednesday that something might be up. Radar and tracking logs showed an aircraft that appeared to be a U.S. Air Force Boeing 747 on its way out of Andrews and over the ocean. And at least one spotter in the United Kingdom appeared able, based on the online feeds, to photograph Air Force One as it passed over northern England. Online trackers appeared to lose the trail over Eastern Europe, but the evidence was sufficient for some users to deduce that Air Force One was headed for somewhere in the Middle East, if not its specific destination. Meanwhile, Trump's profile on Twitter had fallen unusually silent. "I had concerns about the institution of the presidency. Not for myself personally. I had concerns for the first lady, I will tell you. But if you would have seen what we had to go through in the darkened plane with all the windows closed with no light anywhere ... pitch-black. I've been on many airplanes. All types and shapes and sizes ... So did I have a concern? Yes, I had a concern." As commander in chief, Trump has been an outspoken promoter of America's armed forces and veterans but has expressed opposition to the very military operations he now oversees. Until now, Trump also hadn't taken a trip to visit any American forces in a combat zone, as his predecessors had. President Barack Obama made one trip to Iraq during his presidency and four trips to Afghanistan. President George W. Bush visited Iraq four times and Afghanistan twice. In an interview with Chris Wallace on Fox News Sunday in November, Trump was asked why he hasn't visited the troops in Iraq or Afghanistan. "Well, I think you will see that happen," he said. "There are things that are being planned. We don't want to talk about it because of — obviously because of security reasons and everything else. But there are things that are planned. As you know, I was very much opposed to the war in Iraq. I think it was a tremendous mistake, should have never happened." Trump also explained that he had an "unbelievable busy schedule." Trump's claim to have opposed the Iraq War from the beginning was a key part of his campaign pitch — proof, he suggested, of his foreign policy instincts, even if he lacked experience. But numerous fact checks found no proof of the early and vocal opposition to the war that Trump has claimed. Trump's skepticism of foreign entanglements, however, is real. He recently ordered the drawdown of several thousand troops in Afghanistan and ordered all troops withdrawn from Syria, a move that sparked an immediate and forceful backlash from within his own Republican Party. "We have defeated ISIS in Syria, my only reason for being there during the Trump Presidency," Trump announced on Twitter a week ago. The Syria and Afghanistan decisions appear to have been the final straw for Defense Secretary Jim Mattis, who resigned in protest the next day. Mattis objected to Washington breaking faith with its allies also involved in the conflicts. Brett McGurk, the U.S. envoy to the coalition fighting the Islamic State, also resigned late last week. Trump went after McGurk on Twitter and announced Mattis would be leaving two months ahead of schedule, replaced by his deputy on an interim basis. The accelerated departure of Mattis brought criticism even within the broader criticism about the Syria and Afghanistan decisions. "It is a mistake for President Trump to deny the country an opportunity to have a stable transition to a new secretary of defense in this fashion," said Rep. Adam Smith, D-Wash., the likely new chairman of the House Armed Services Committee. Other critics, including many congressional Republicans, said Trump's decision to abruptly withdraw troops would alienate and endanger U.S. allies and embolden ISIS, Russia, Iran and the Syrian regime. Trump rejected that, tweeting: "If anybody but your favorite President, Donald J. Trump, announced that, after decimating ISIS in Syria, we were going to bring our troops back home (happy & healthy), that person would be the most popular hero in America," Trump tweeted. "With me, hit hard instead by the Fake News Media. Crazy!" While it is true that ISIS has lost control of the wide swaths of territory it once held in Syria and Iraq — the so-called caliphate — proclamations of the group's total defeat are premature, officials inside and outside the administration have said. Earlier this month, McGurk said it would be "reckless" to consider ISIS defeated and unwise to bring American forces home. "Even as the end of the physical caliphate is clearly now coming into sight, the end of ISIS will be a much more long-term initiative," McGurk told reporters on Dec. 11. A Department of Defense Inspector General's report from last month described complicated conditions on the ground in Syria and Iraq, with ISIS operating an insurgency in both countries and maintaining some of the bureaucratic structures of the caliphate it temporarily formed. "According to the Department of Defense (DoD), ISIS has lost control of all the territory it once controlled in Iraq, and remains in control only of an estimated 1 percent of territory it once held in Syria. However, both the DoD and a United Nations (UN) Security Council monitoring committee report stated that an effective clandestine ISIS organization appears to be taking hold in both countries. "The DoD reported to the DoD Office of Inspector General (OIG) that ISIS's retention of desert terrain along the Iraq-Syria border bolsters its ability to operate underground in Syria and to plan and carry out attacks against both U.S.-backed Syrian Democratic Forces (SDF) in the northeast and against pro-Syrian regime forces elsewhere. Moreover, the UN committee report and the DoD stated that at least some of ISIS's bureaucratic structures remained intact, and ISIS continued to derive revenue from multiple sources, including drug trafficking, extortion, and cash reserves. The report also said that a lower than expected outflow of foreign ISIS fighters suggested that many of them were hiding in sympathetic local communities in Iraq and Syria." NPR's Jane Arraf reported earlier this month from an area of Iraq where the Iraqi military, in cooperation with the U.S. and other coalition partners, is working to flush out what remains of ISIS. "ISIS has made a comeback in the mountains and along the border with where Iraqi forces have recently sent thousands of soldiers. An entire division — more than 10,000 soldiers — are deployed now near the Syrian border, along with the militias that are part of Iraqi security forces," she reported. Arraf's story concluded that "ISIS has been driven out of the cities, but the battle isn't quite over yet." In Iraq, the country's security forces are "years, if not decades" away from ending their "reliance on Coalition assistance," according to the inspector general's report. "The DoD reported to the DoD OIG that Iraq's security forces continued to exhibit systemic weaknesses this quarter, including poor intelligence fusion, operational insecurity, ongoing corruption, and overly centralized leadership, among other problems."